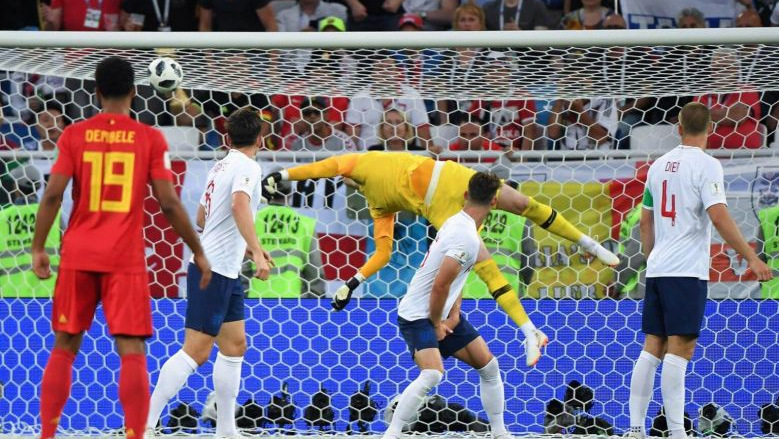 FOOTBALL: Belgium beat England to top spot in their World Cup group last night after Japan sneaked into the knockout phase on the back of their superior disciplinary record. The 1-0 win for Roberto Martinez’s much-changed team in Kaliningrad earns a second-round tie against Japan while England have a trickier-looking match against Colombia. But the result also means Gareth Southgate’s young side avoid the top half of the draw in Russia, which contains heavyweights France, Argentina, Portugal and Brazil. The two managers made a combined 17 changes to their starting line-ups, with World Cup top-scorer Harry Kane missing for England and Romelu Lukaku, Eden Hazard and Kevin De Bruyne all absent from Belgium’s team. Former Manchester United forward Adnan Januzaj made the difference, curling a superb shot past the outstretched hands of Jordan Pickford in the 51st minute. Belgium’s Martinez was delighted with the win, saying it was impossible to plan the ideal scenario as the World Cup unfolds. “We want to win football matches and we also know the big game is the knockout tie to come, so it was difficult to balance all of those,” he added. In the other match in Group G, Tunisia notched their first win at a World Cup for 40 years, beating debutants Panama 2-1 to leave Russia on a high. The Belgium win capped a strange last day of the group stages in Russia after Colombia earlier qualified top of Group H, with Japan joining them in the knockout phase despite a 1-0 defeat to Poland in Volgograd. As the minutes ticked away the players slowed to a walking pace in a farcical end to the match, with both sides settling for the status quo. Four hundred miles (640 kilometres) to the northeast in Samara, Senegal, level with Japan on points, goal difference and goals scored, knew they needed a goal to nudge the Asian team out of the qualification spots. Japan coach Akira Nishino said he was “forced” to tell his players to slow down at the end and not take any risks, despite boos ringing out from spectators. “It was a very tough decision,” he explained, adding: “I chose to keep the status quo in our game, and rely instead on the other result. Colombia coach Jose Pekerman said he was relieved his team – who reached the quarter-finals in Brazil in 2014 – were going through from a tough group. “This was a very even group and you see that with Senegal, who had a very good tournament, going home,” he said. The remaining teams at the World Cup are still taking stock after the dramatic exit of Joachim Loew’s 2014 winners, who finished rock bottom of their group after a 2-0 defeat to South Korea. Germany apologised to the country on their official Twitter account before the team landed in Frankfurt. Defender Mats Hummels had earlier tweeted out his regrets with a succinct “sorry...” and a crying-face emoji. German media have given a damning verdict of the campaign, which will be remembered as the first time since 1938 that the country has failed to make it past the first round. “No words!” chided the best-selling Bild daily, over a picture of a despondent-looking Toni Kroos. Despite a huge scare for Lionel Messi’s Argentina, who needed a late goal from Marcos Rojo to edge through to the knockout phase, all of the tournament’s other big guns are through to the last 16 in Russia. Friday is a rest day. The last-16 ties start on Saturday, with France taking on Argentina in Kazan and Uruguay facing Cristiano Ronaldo's Portugal in Sochi.